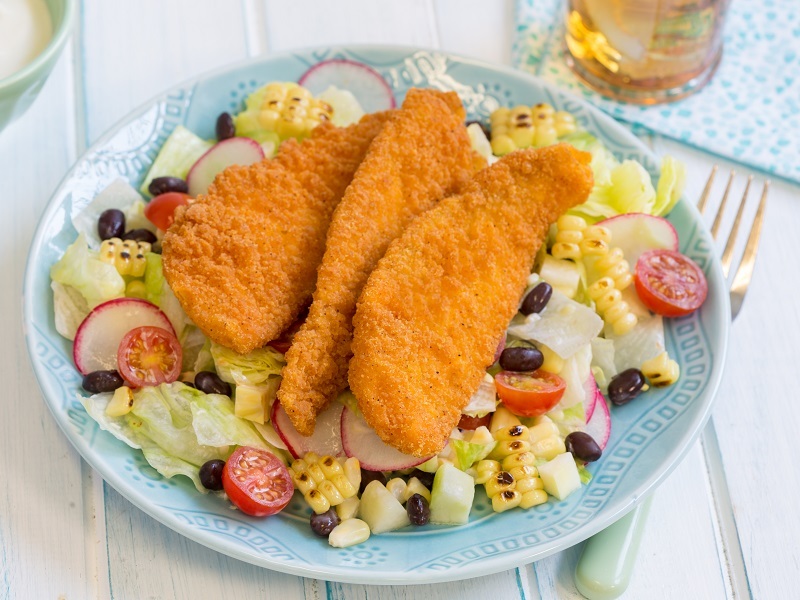 Crispy Southern Flounder are small two-bite strips of hand-cut natural flounder fillets with a flour and cornmeal coating and flash-fried; their perfect size, gnarley appearance and classic crunch make them incredibly versatile. Do Not Thaw * Do Not Overcook. Fry in clean oil at 350°F / 177°C for 3 to 3 ½ minutes or until golden brown. Convection Oven: Preheat oven to 375°F. Place product on baking sheet and cook for approximately 12-14 minutes. For best results, apply non-stick coating to the baking pan and turn the fillets over half-way through baking. NOTE: Cooking times may vary, cook to an internal temperature of 165°F. Flounder, Bleached Enriched Wheat Flour (Wheat Flour, Niacin, Reduced Iron, Thiamine Mononitrate, Riboflavin, Folic Acid), Water, Wheat Flour, Enriched Wheat Flour (Wheat Flour, Niacin, Reduced Iron, Thiamine Mononitrate, Riboflavin, Folic Acid), Cottonseed And/Or Soybean Oil, Modified Corn Starch, Salt, Dextrose, Wheat Gluten, Extractives of Paprika And Annatto, Garlic Powder, Monosodium Glutamate, Natural Flavor, Onion Powder, Spices, Sugar, Citric Acid, Chili Pepper, Leavening (Sodium Aluminum Phosphate, Sodium Bicarbonate), Yeast, Sodium Tripolyphosphate (To Retain Moisture). May Contain: Egg, Milk, Soy.